Today sees the release of two new tools (they've been done for a while, I just haven't released them). The first is Sage Cameo Mapper 1.0. 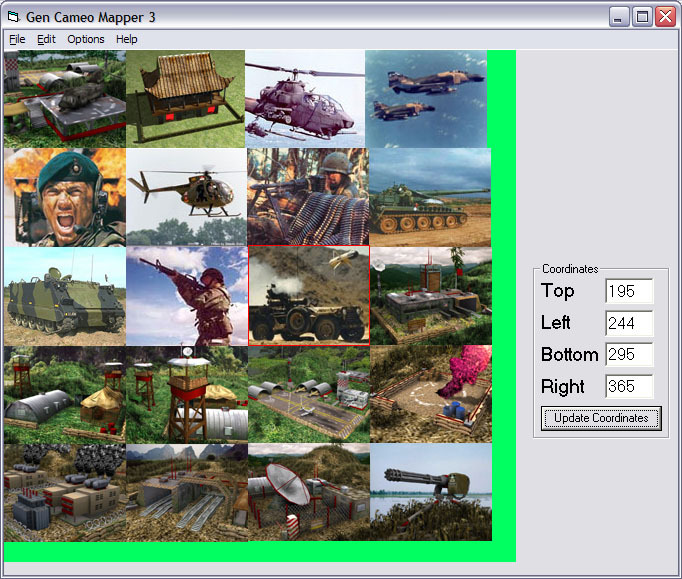 This is a complete rewrite of GenCameoMapper, using C# and the .NET Framework 2.0. This means that you will need to have the .NET Framework 2.0 installed. I think the application installer will check that and prompt you to install it, but I'm not entirely sure. You can find the installer package here. You may receive a warning that the publisher cannot be verified, which is normal, since the binary is not signed by Microsoft. You can feel free to install it if you trust me (The URL listed is for Mastermind Development which is my personal development "firm"). The second project is the Sage Command Set Validator, or Sage CSV. It is another C# application (I think) that will check to ensure that all buttons referenced in the command sets are valid. This can be a source of annoying errors, and somewhat difficult to track (at least I remember it being a hassle). You choose the location of the Command Set file, and it will automatically load the Command Button file from the same location. It will then point out any errors, which you can fix in the big pane (I don't have the INI files handy to test myself, so I'm going on memory...). You can grab the executable in a zip file here. Just extract and double click to run. Both of these are technically beta, and I don't have any plans to support Sage CSV. I know a couple people have found it useful, so I'm releasing it, but I make no guarantees that it won't destroy your command set or command button file, or if it is compatible with anything other than Generals and Zero Hour. Happy Testing! 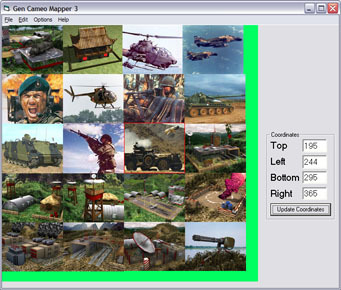 I just updated the download of GenCameoMapper to version 3.0.1. This removed an extra option to import JPEG and BMP images that was not actually supposed to be there. The new version can be found on the downloads page here. 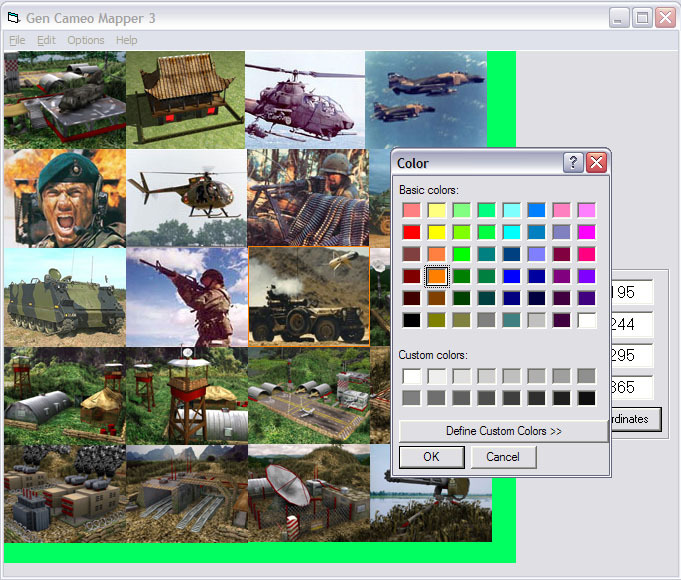 It's been in private beta for a while, but GenCameoMapper 3 is now available for download. You can get it from the downloads page here. New features include a bounding box shown when an image is mapped, the ability to map multiple images in a single session, and the ability to tweak the colors of both the bounding box, and the background for mapping (only when loading a new image). You can also now adjust the coordinates while mapping (by using the text boxes at the far right of the screen) and see the results by hitting the Update Coordinates button. I will hopefully be updating the About page soon, and also adding a new tutorial about using the new and updated features in GCM 3. Production is progressing very rapidly. This post is to ask for a small number of beta testers for a short closed beta test. I think it's about ready for release, but I want a few other people who aren't me to play with it and try to break it. If you're interested, please contact me on the forums or through e-mail. My e-mail is mastermind2004[at]gm[nospam]ail[dot]com. Like a thief in the night, a new version of GenCameoMapper is trying to sneak in. This one is 3.0, and includes some improvements that I've been thinking about for a while. Details are still sketchy, but it has been confirmed that there will be a nice little box showing you the area you have mapped out. It can even be customized in your choice of colors. Mapping multiple files in one session should also finally be possible. And, for those of you that like pretty pictures, here are a couple in development shots of the tool in action. Thanks to Vietnam Reborn for "letting" me use their cameos as an example.